"One Big Home tells a fascinating story of conflicting visions of economic development on Martha's Vineyard, and by extension, the entire country...In doing so it focuses on the broader questions of how we ought to live our lives as human beings and consumers...The film shows that residents of any community can organize and educate one another, work with local planning boards and elected officials, and help to shift their neighborhoods and cities away from ill-planned growth and its environmental impacts and toward a far more sustainable future." "A valuable classroom resource for both sustainability and urban planning classes. There are no easy answers in this film--as the filmmaker learns when he tries to decide how big his own house should be. The many viewpoints shown here and the town's long process toward resolution are sure to fuel classroom or community discussion on how sustainable development might best be achieved in other settings as well." "When it comes to houses, size matters...One Big Home reveals the deep divisions caused by the clash between current residents and new ones who have the money to build their dream homes. For students and others, it demonstrates how citizen participation on limiting residential development can help preserve community character, raising key questions on the balance of private property rights with land use regulation." "A very thought provoking film...This is a film about the nature of community itself; the balance of the collective concerns and rights of the community versus the rights of the individual and how people come together to try and solve a problem...You see the struggle of democracy in process; slow, messy, sometimes contentious but eventually productive. It's a beautiful thing to watch." "One Big Home is a must see for architects, planners and activists...A fascinating documentary." "One Big Home...really stands out in the current climate and will give US cinemagoers something refreshingly different to engage with...Intelligent and thoughtful." "When will a small community fight to protect its character? 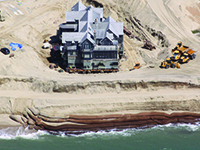 One Big Home provides an engrossing case from Martha's Vineyard where the residents of Chilmark observe and debate the construction of giant homes. Students, activists, and community leaders will be inspired to consider their role in their own communities as well as both what Americans consume and what Americans value." "One Big Home is a must see for architects, planners and activists. It is a fascinating documentary of one man's quest over a decade to restrict the building of gargantuan homes on Martha's Vineyard." "The documentary's success is that it includes the viewpoints of multiple parties - avoiding a one-sided bias...Bena's film becomes not so much an indictment of mega-mansions, but a rallying cry to local communities to have a voice in the conversation." "Aside from spotlighting the essentialness of local government, the film draws compelling connections between property ownership and oft-unexamined ideals of liberty...As the film's title suggests, the biggest home is one all humans share - and it can only satisfy unstoppable appetites for so long." "Highly Recommended...Architects, building inspectors, academics and local residents are among those who present compelling arguments for both perspectives...By honestly showing the complexities of the process and the people, this film provides a myriad of excellent starting points for discussions that are not restricted to development and local policy, but which could delve into social and historical areas as well."